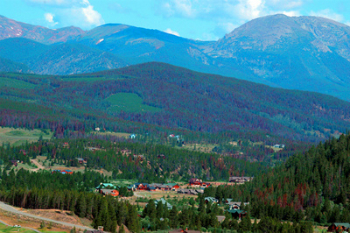 Ten Mile Vista homes for sale have exactly that – a view of the Tenmile Range – that is not obscured by the tall condos that surround downtown Breckenridge. Ten Mile Vista is located north of town, with easy access to Frisco and I-70. One of the first subdivisions developed after the creation of the Breckenridge ski area, Ten Mil Vista lies along the bottom lands of the Swan River. The lots are relatively flat, and are an easy walk or ski to national forest trails. Tenmile Vista is not part of incorporated Breckenridge, but is an easy drive from downtown, just north of Tiger Road across from the Breckenridge Golf Course. Discover more about living in the area, or start your search with the updated Ten Mile Vista real esate listings below. Tenmile Vista homes are in an area drenched in sun, on very gently rolling hills around the Swan River. The hospitable nature of the land here is evidenced by history, and the number of populous, small settlements of established near here, during the mining era. All the homes were built one at a time, many by long-time locals for their families, a few were intended as summer cabins, and recently local architects are finding the few remaining vacant lots and building homes in the modern rustic style. This style has builders sourcing used timbers, and green building materials. Ten Mile Vista stretches out around the Swan River, which spanned several gold mining camps in the 1880s, and more recently hiking trails and is, of course, great for fishing. Access to national forest is easy from Tenmile Vista, the 27-hole public golf course is across Tiger Road, and relics of the mining days remain up the Swan valley. Great hiking and mountain biking routes start in the Swan, and road bikers like the paved Tiger, and Summit Estates road. Size: 864 sq. ft. to 6338 sq. ft.
From Breckenridge head north on Highway 9 for about 3 miles to Tiger Road and the sign for the Breckenridge Golf Course. Turn right (east) on Tiger Road and continue a little more than 1/2 mile and turn left on any of the streets of Tenmile Vista, such as Upland, Braddock or Swan. 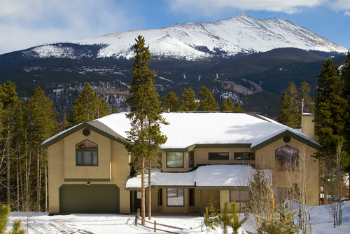 Find out how Breckenridge Associates can help you with your real estate transaction. Send us a message today to get started!